We’ll have some updated news and opinions soon but first we wanted to share the press release as soon as we can in full that advocates that CAMRA, as part of its far-reaching Revitalisation, it will embrace ‘quality’ beer and not just real ale. The Campaign for Real Ale (CAMRA) is set to widen its remit to represent drinkers of quality beers, ciders and perries of all types, as well as moving its focus beyond traditional pubs, if its members approve recommendations put before them in April. 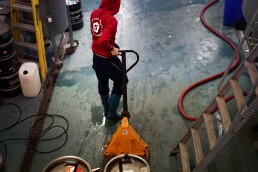 New Zealand brewing company Yeastie Boys have taken a further step toward making United Kingdom their major focus by announcing the signing of renowned brewer James Kemp from Manchester’s Marble Brewery. From mid-March James – a respected former brewer of Thornbridge Brewery and Buxton Brewery – will take over the lead brewing role for the small multinational New Zealand company. Yeastie Boys’ irreverent ales – founded down under in 2008 and now brewed in New Zealand, Australia, and United Kingdom – have made a considerable impact in the UK since arriving in 2015 and the business recently announced that they had tripled UK sales in the 2017 calendar year. “We’ve got off to a cracking start in the UK, from absolutely nothing, but we’re always thinking of the future and this was the perfect place to bring someone on board” Yeastie Boys’ founder Stu McKinlay explained. “Bringing James into the team is an investment in our brand as well as the product. We’ve long been known for innovation but in the UK we’ve focused on our core range products, only bringing in very small volumes of seasonals and specials from New Zealand. James Kemp said: “I’ve been a fanboy of Yeastie Boys since I first tried Pot Kettle Black almost ten years ago and I’ve always considered them to be one of the most exciting and edgy breweries in the world. I’m really looking forward to having a lot of fun making great beer and helping take them to the next level. Yeastie Boys – who celebrate their tenth year in 2018 – are now just over two years into in brewing in UK and are a year into production in Australia. 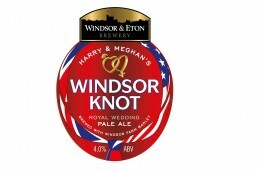 Windsor & Eton Brewery has a Royal connection based on proximity alone, but in a clever tie-in with the Royal wedding, the brewery has released a beer called Harry & Megan’s Windsor Knot using barley grown on the Royal farms. The beer is a special limited edition release of their best-selling Windsor Knot, which was first brewed for the marriage of Harry’s brother, Will. Just like the original Windsor Knot, this pale ale will be the only royal wedding beer brewed in Windsor. The new beer was inspired by the couple’s first public appearance together at the Invictus Games in Toronto last year. Harry & Meghan Windsor Knot will be available in both 330ml bottles at 4.5% ABV and in cask at 4% ABV and the first orders are shipped on Tuesday 3rd April.